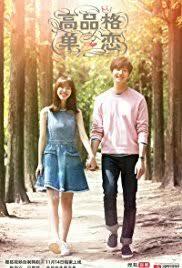 Romantic comedy depicting the heartfelt and pure love story by a man, Choi Se Hoon (Jung Il Woo) a successful CEO with everything in his hands. He falls in love for the first time in his life with a woman, Yoo Yo Ryung (Jin Se Yun) who has been living in completely opposite circumstances from his and is a rising artist in his own company. It's the same old same old ultimate jerk, falls for the naïve innocent country girl, being himself and ruins every chance at the relationship. Nothing new, but I always get sucked in anyway so... It helped that it only was a webdrama, so 20 min each episode. That was more than enough. Male lead was THE only reason for watching. Female lead was clueless for the entire time, zoned out to silly land, plus her acting was ‘blaah’. The other cast of characters were more childish than female lead (really overacting and silly). It wasn’t the best, but darn it, it gave me the warm and fuzzies. So if you're in that kind of mood I suggest this and say enjoy!